This is the fifth volume in this popular series of deluxe, small hardcover books that contain a collection of hundreds of direct quotes and short sayings of great saints, this book being from the writings of St. Thomas Aquinas. His words are arranged and classified by the virtues represented in the 15 decade Rosary. 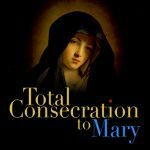 The Rosary mysteries provide us with a mosaic of virtues for the spiritual life, a ladder for advancing in holiness and in love of God and neighbor. The previous volumes in this series featured quotes from the writings of St. Therese of Lisieux, St. Francis de Sales, St. Catherine of Siena, and St. Teresa of Avila. These lovely little books provide a handy pocket-sized volume of hundreds of meditations for prayer and spiritual reading arranged by themes and virtues. They are ideal for anyone to carry with them to use for daily spiritual reading and inspiration. Imagine spending a few minutes each day with the great St. Thomas Aquinas, the Angelic Doctor, widely considered to be perhaps the greatest mind in the history of the Church. Now you can do just that with this well-researched little collection of the most profound and practical insights from St. Thomas on so many important spiritual themes.